Ashley’s first poetry collection, (32pgs) edited by Graham Nunn and published with the assistance of Small Change Press in 2008. 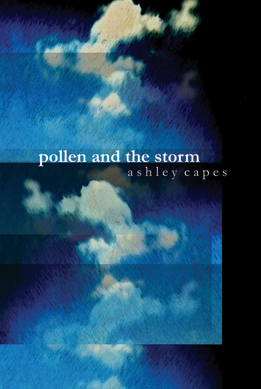 Ashley Capes’ exquisitely crafted poetry in pollen and the storm explores single moments, from an intimate view. His are deep and perceptive poems, that draw the reader in. ‘31 Anderson Street’ shows a moment in time where the domestic grind drives us toward a different reality: she watched the cars/smoking/ as she dragged in the evening/ pollen and the storm/ coming unstuck, fluttering to the road/ where she caught their scent. The poems in pollen and the storm express hope, Capes is, however, still aware of the impermanence of things: the past moves into shot/ like a death cap/ bursting from/ earth, smooth/ green (taken from the poem ‘prune’). Whether the mood of the poem is romantic, hopeful, pertinent, or expansive, Capes’ ability to vividly realise each moment will have you wanting to revisit each poem again and again. Ashley Capes is a poet of spirit and a poet of place, and the scent and sense of his imagistic landscapes instill breath and animate his words and the stories he tells in his new publication pollen and the storm. Capes doesn’t just bring the places of his life to you as you read, he brings you to them, and for moments one can become lost in the elsewhere of distant hills and the scent of the sea and songs lit by the inviting glow of memory. In his poem “pedestrian”, Capes makes a study of his urban world “feet bully the pavement / and cars slip down the highway” – how telling that word “bully”. Capes has written many comparable lines in this fine and accomplished collection. We want to be dazzled at the freshness of language and insight and we are. and cars slip down the highway.